FOOD ON CAMPUS: Danner Hall Food Services just after lunch on Tuesday, May 7. 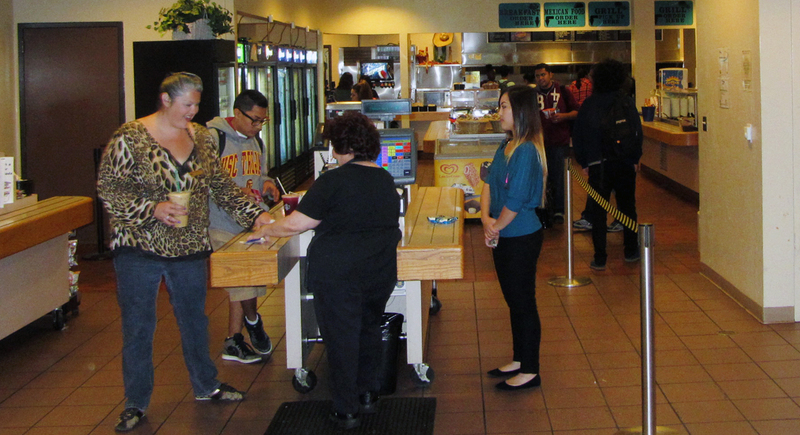 Danner Hall is still the home of food services despite rumors of iminent closure. On Thursday, May 2, Fidel Cabuena, Director of Auxiliary Services, met with the Associated Student Body Government to discuss ideas for both Danner Hall and the Bookstore. “Only part of the current cafeteria is currently being used for culinary arts lab space,” said Cabuena. The Culinary Arts department has dealt with a very limited space for quite some time and because of this problem some of the food has to be prepared in other locations around campus. Danner Hall would become the classroom space that the program needs in order to provide the best possible food service on campus. The opening of food services in the bookstore itself would allow students to get food on campus later. Right now the cafeteria closes at 1 p.m. everyday. This would actually be great for students who have evening classes on campus but don’t want to have to go off campus to purchase food. It is currently unclear as to what will happen with the proposal. However, none of the six food services employees will be layed off as a result of this proposed idea. Students were not notified of the proposed changes via email because the idea is still in the planning stages. Last year alone food service lost $426,000 in profits. If the plans work out it can help food services become self sustaining. Java Jitters is currently the only outlet of food service that is sustainable. The proposed changed would allow students greater access to food on campus, allow for more educational space and help food services get out of the red.